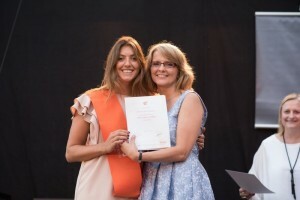 Isabella with E. Boniuk, MBA Director during the graduation. We interviewed Austrian MBA alumna Isabella Steyer-Mader, who brought a wealth of experience to the class. Before the MBA, she had already lived on several continents, played volleyball for Barça FC and worked in a startup. Since graduating EADA, she has joined the graduate programme of Edenred Paris. Her next assignment will be in Brazil, where she will hold the position of digital marketing and product manager. Doing an MBA gave me the chance to reevaluate my career and develop a new professional path, as well as opening me up to new cultures and thought processes. As I already had work experience, what made the difference for me was the real practical work in class and seeing that it would be useful for my career. This was new to me, as after my undergraduate degree, I did not have the same opportunities to discover new career paths. Of course, another big part of what the MBA meant to me is the friendships I made. I met interesting, unique and highly skilled professionals –both classmates and professors– on a daily basis. As you know, right now I am part of a graduate programme, and I am about to be sent to Sao Paulo to work as the digital marketing and product manager. This programme lasts two years and I am excited to see which country I will be sent to after the year in Sao Paulo. I try to keep myself open to new opportunities –like the graduate programme. In fact, the inclination to be flexible and dream big comes from the MBA. What aspects of the MBA would you highlight? First and foremost, the people! The range of professional backgrounds and nationalities. The opportunity to learn with and from fellow classmates is very valuable –in my current job, I can see the correlation between different cultures and working styles. The professors were also great; it was amazing to see friendships and mentorships develop with them over the year. The soft skill modules in the Residential Training Campus are a unique method for getting to know yourself and your leadership qualities. The international trip with the specialised Path of Development was also an amazing experience, not only in terms of professional development, but also in terms of the friendships that are taken to another level. Which was the most rewarding moment of your year in EADA? One of the most rewarding days for me was the final project presentation. To see what you and your classmates can achieve is truly inspiring, as is the feeling when you get great feedback after a year of hard work.